Translations: Ripple Island English translation released! 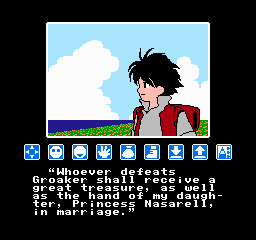 Over 30 years after its original release, Sunsoft's Ripple Island has finally received an English translation! 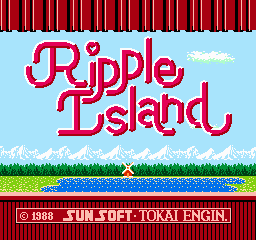 Ripple Island is a 1988 adventure game for the Nintendo Famicom developed by Tokai Engineering. It stars Kyle and Cal as they journey across the titular island to save its kidnapped princess and stop an evil would-be emperor from destroying the isle's lush natural environment. Its gentle story and fairy tale atmosphere set it apart from the wave of murder mystery games flooding the Japanese market at the time and won the hearts of many players. Unlike many of its contemporaries, the game offers several different endings depending on the player's choices throughout the game. Make sure to see them all! This project was a collaboration between Supper (hacking), TheMajinZenki (translation), and cccmar (editing/testing). Thanks to everyone for their hard work. Re: Translations: Ripple Island English translation released! Congrats on a speedy release! I think this is also one more game off the early Famicom games list. It doesn't quite fall into the '87 list, but it's still not too far off. '88 saw plenty of adventure games, most of which being murder mysteries (no surprise there). RI is nice in that it has some surprising events/unexpected endings. Back from the dead, mostly. I've honestly been waiting for this. Excellent work. The Homepage of the Oldternet - Where it's always 1992 (or so). Thanks! Not sure if 1988 really counts as "early" or not, but it's nice to whittle down the Famicom list a little. As popular as it is, it's amazing how many game still aren't translated. Gratz on the release guys, currently playing this over a few days as i'm writing a guide for it on my website, it's a fun little game so far. Looking forward to seeing all 5 endings and it seems to be working perfectly fine on FCEUX so far so no problems there. I DO have a question though.. The passwords - is this a unique code for everyone OR does everyone get the same codes in the game? Any hows, thanks again for this great translation.